The Meade Instruments LX85 6" f/5 Reflector Telescope utilizes a highly-reflective parabolic primary mirror to produce bright and clear views of difficult-to-see deep-sky objects like wispy nebulae. The Newtonian reflector design enables larger apertures than are practical in conventional refractors, allowing novices and intermediate astronomers to reach out into the universe with ease to enjoy wonders like galaxies, nebulae, globular clusters, and more. Added to this already impressive performance is a sturdy rack-and-pinion focuser that is outfitted with a 2" holder for eyepieces and accessories. 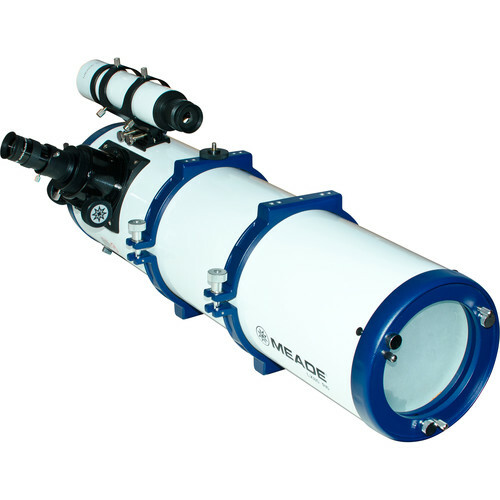 A 1.25" reducer adapter is also provided to use smaller (and more common) eyepieces and accessories. To help get new users started, Meade includes two eyepieces that produce low and high magnifications, along with an 8x50 finderscope. This version of the LX85 is offered here without a mount or tripod for users who already have a reliable support system and are looking to upgrade their OTA, or add another to their astronomy kit. It is outfitted with a Vixen-style dovetail rail to make it compatible with a wide variety of mounts from virtually any manufacturer. Aperture 150 mm / 6"
Eyepiece Barrel Diameter 1.25", 2"
Box Dimensions (LxWxH) 34.5 x 12.5 x 12.5"